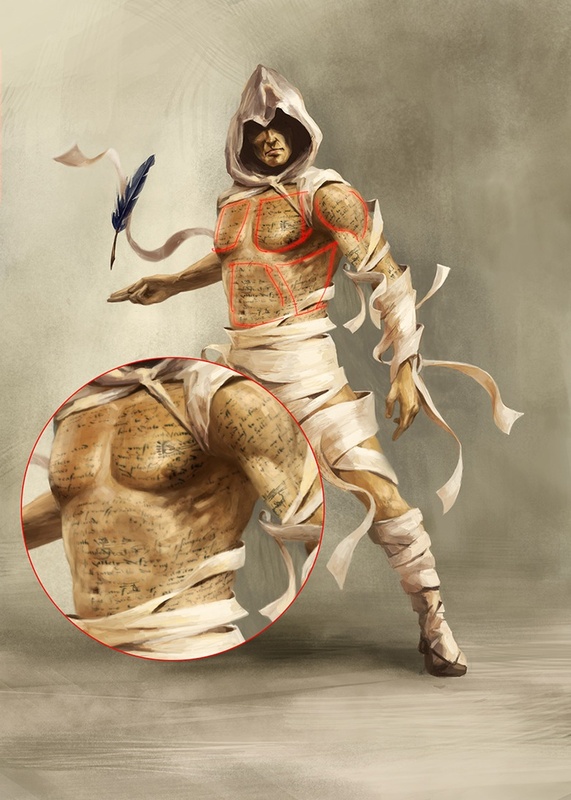 This characte's skin should be covered with hieroglyphics or calligraphy and the costume should resemble parchment. 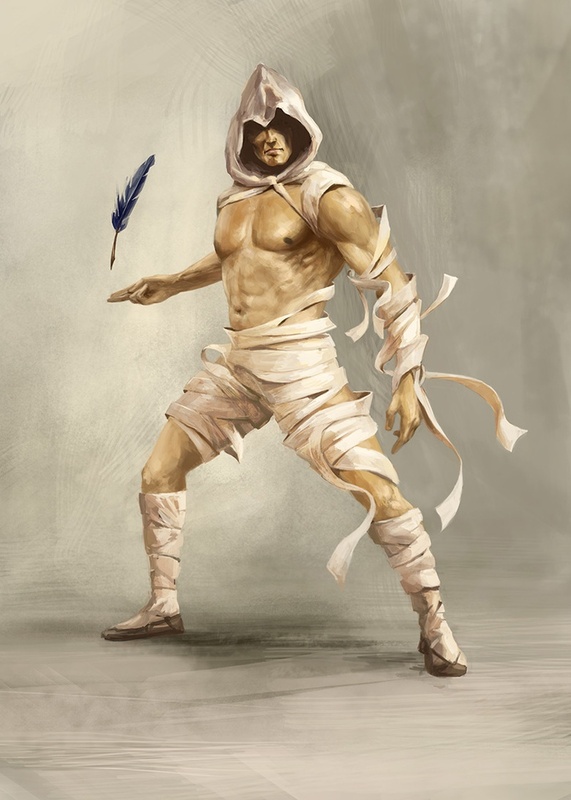 He or she uses a quill like a wand to trace sacred or ancient texts to curse a victim or have them bound in parchment, which is then swiftly inscribed to form a supernatural barrier used to constrain them. Beyond these criteria the design was open for interpretation, but as often with superheroes (or villains) they are meant to look dynamic due to their unusual powers. This naturally brings into question their movement and form of attack, and as a result raises the issue of posture and how to portray their characteristics. This character was intended to a villain, but it didn't really matter what his alignment was as much as it did his description. His superpowers and form of attack were the crucial aspects that would help determine an interesting posture, as well as his style of fighting. His costume description and weapon suggested a certain delicacy, while still being deadly, and staying away from a heavy-handed, brutish nature. 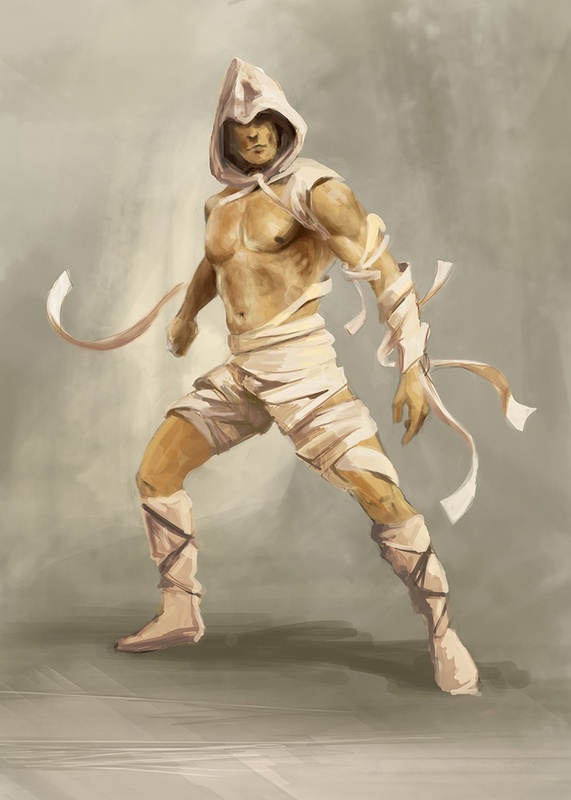 It was this that suggested a refined fighting ability akin to martial arts and so helped when it came to exploring various stances. I imagined him to be quick and dexterous, light on his feet and able to scrawl his quill at lightning speed. With this in mind I started looking at martial arts references, such as the infamous Shaolin monks as well as ninjas who epitomize both grace and deadliness at the same time. Fig.01 shows a number of quick thumbnails exploring different postures. I added some flowing lines around the upper-left sketch alongside a tattered cape, which created a nice dynamic. The static nature of his pose contrasted well with the rhythm of the flowing brush work and generated a certain tension. 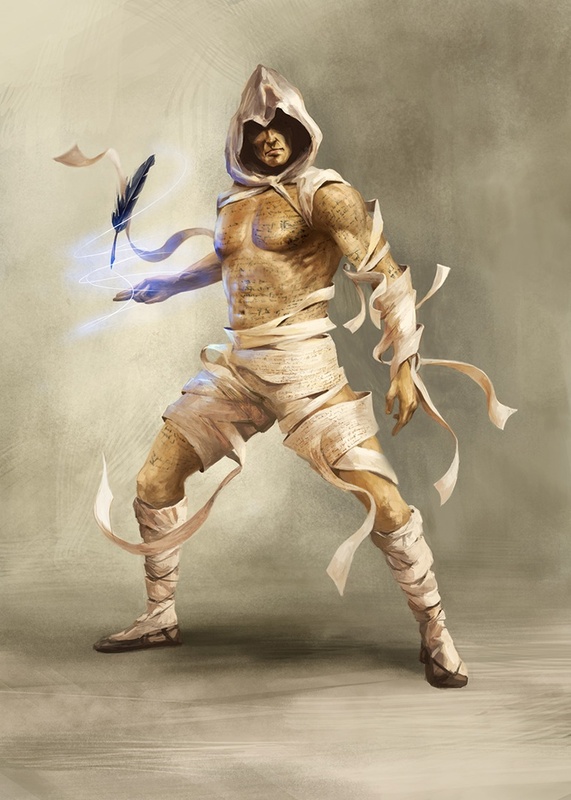 I imagined that he could conjure rolls of parchment, which unwind from his costume to wrap around victims, binding their hands and legs. 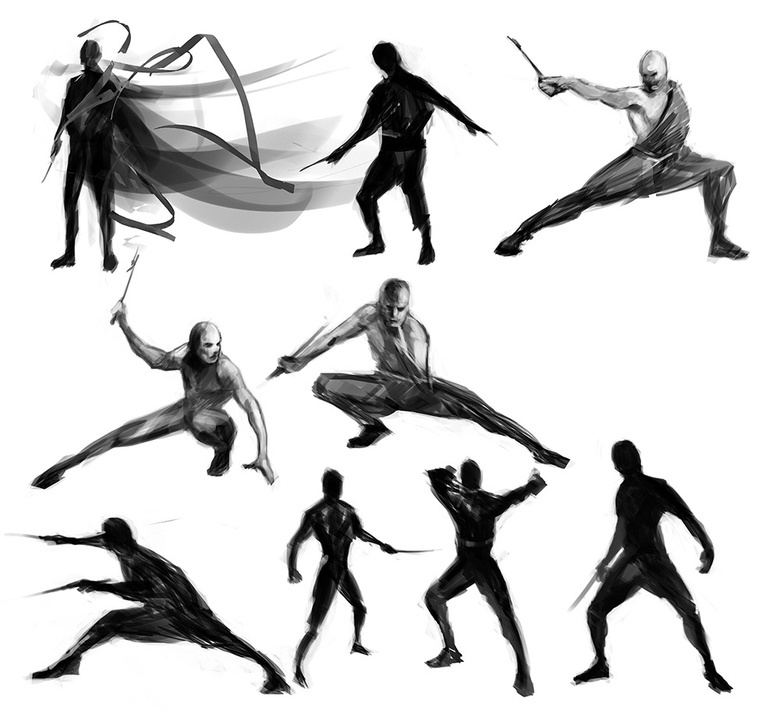 Some of the thumbnails resembled Kung Fu stances too overtly that I was not keen on, but another issue which needed resolving was that of costume. 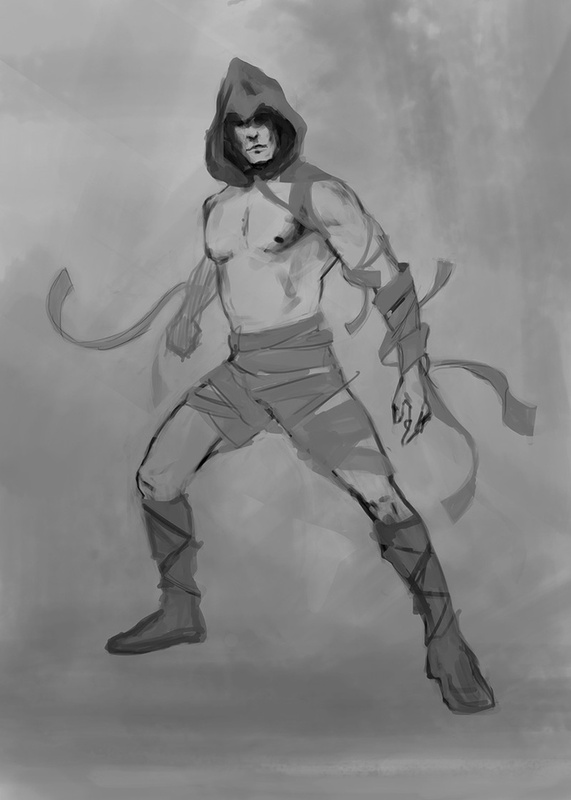 I didn't want him to look like a monk with traditional robes, but was not sure what kind of period to base him on. I started www.zpfl.netbining clothing from various periods and character classes with influences ranging from Tudor gents through to musketeers and pirates, as well as more Oriental flavours. 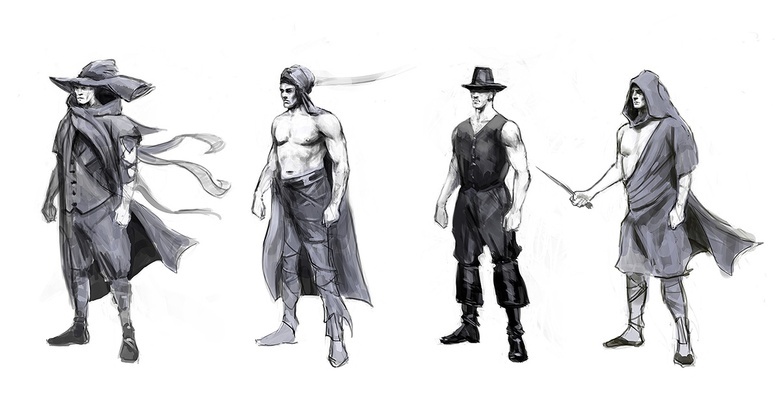 In Fig.02 we can see this mixture of influences with each drawing on different periods and costume types. As opposed to trying to draw each dressed in parchment, I thought it best to decide on a style and then convert this into parchment in the final piece. I liked aspects from each version, but as is often the case I ended up welding various www.zpfl.netponents together in the final concept as opposed to resolving the problem at this stage. I liked the flowing lines on the far-left character, a remnant from Fig.01, but also liked the idea that the trousers on the character to his right could be made from parchment coiled around his legs. I wanted some form of head wear and the fact that the smaller of the two hats concealed his eyes added a sinister quality, which also felt appropriate. A semi-clothed body was more interesting to me, as was the hood, which looked less theatrical. Despite not having a fully resolved design, I felt I had enough information to begin the final piece. Fig.03 shows the initial sketch, which draws on the lower right thumbnail from Fig.01. I chose this pose because it suggested a startled moment preceding an attack; a kind of pregnant pause before our assailant unleashes his quill in a frenetic encounter. 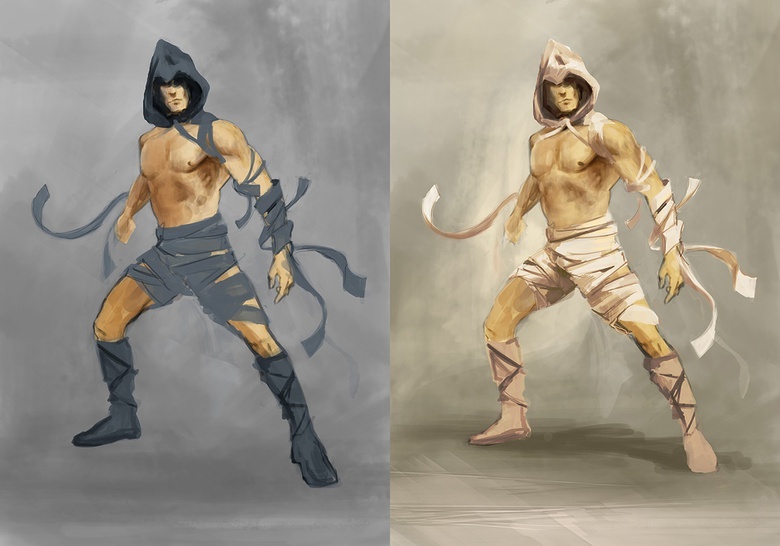 I opted to include the shin strapping and hood from the far right character in Fig.02, but devised some clothing made up of parchment roll (top left Fig.01). I imagined this whirling and twisting around him independently as he moved, like a flock of seagulls around a fishing boat. I kept the clothing on a separate layer to begin with so I could change the color scheme quickly. Fig.04 shows two initial phases, one light and one dark. Although I liked the contrast of the dark one it didn't suggest parchment, so I rejected it. At this stage I was using four layers: the background, character, clothing and color. This way I could easily change elements independently and experiment with the color palette. Once I was satisfied I started to flatten certain layers, which in this case were the color and character ones. Because the clothing was unresolved at this point, I decided to keep it separate. I started to add some rim lighting to the left side of his torso, as well as building some volume into the torso and limbs. At this point there were a few anatomical issues including a problem with the deltoids, which were in the wrong place, the shape of the rib cage and the perspective of the legs. These could have been amended here, but with the Warp tool it was easy to move things around at any point and alter proportions. 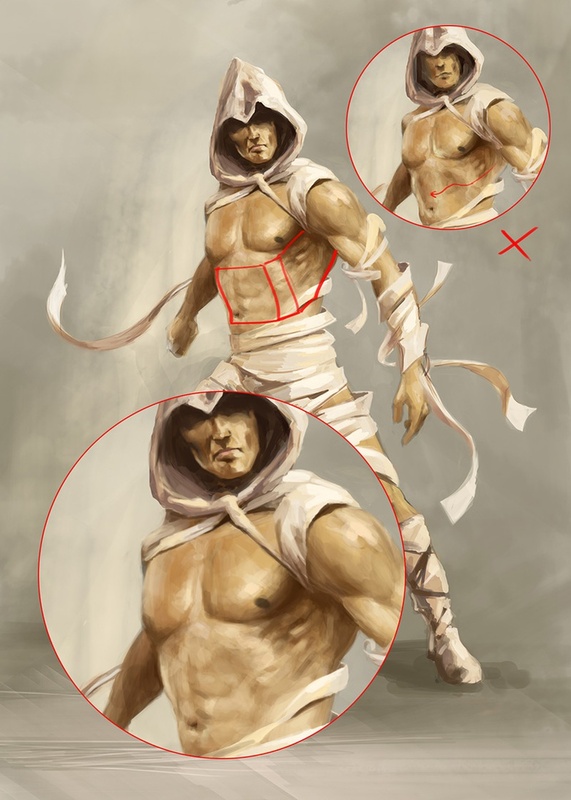 Fig.05 shows a more developed stage in the clothing, but before refining it too much I needed to address the torso and face – two crucial areas. When focusing on details it is always worth taking a step back and looking at the overall picture to check that the foundations are correct. In this case the basic shape of the rib cage was incorrect due to the awkward relationship between the shadows and highlights. In Fig.06 you can see the problematic contour of the torso in the upper right and the shape it should assume in the center, indicated by the red lines. I also modified the face here, again focusing on planes and establishing volumes. I was less than happy with his balance and so, using the Lasso and Warp tools, I rotated the upper body clockwise (Fig.07). I retained the tilt of the head, but leveling the shoulders lent him a more assertive posture as opposed to puzzled or curious. You will also notice that I began tidying up the lower leg area, making it more consistent with the rest of the costume. The one remaining section that lacked definition was his trailing arm, which seemed very unexpressive. I wanted to have him holding his quill, but deciding on a position was difficult. I tried with him holding it in a conventional manner, but it looked somewhat whimsical and lacked real punch. I then experimented with a more unusual pose and after trying to place the quill across his palm, realized it looked more sinister floating above his hand. This suggested a supernatural power and was more in-keeping with his description (Fig.08). The image at this point was looking fairly www.zpfl.netplete, although there were still a few important issues that needed resolving, not least of which was the right arm. 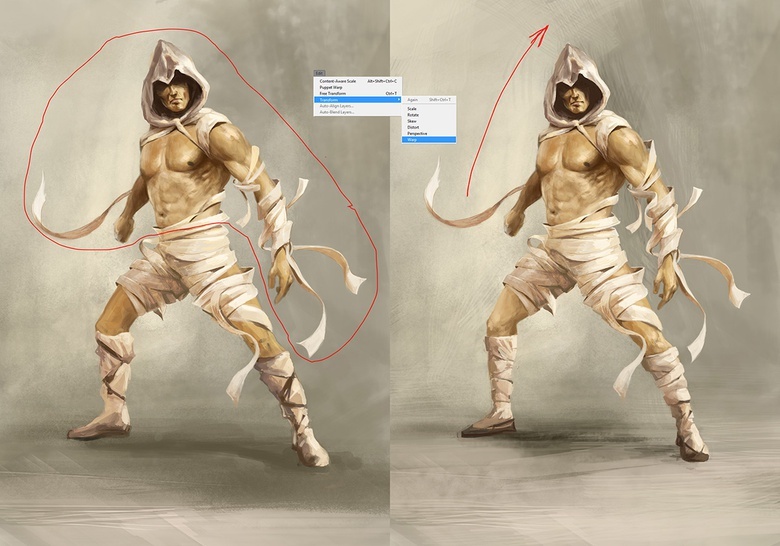 I merged the clothing and character layers and then, using the Lasso tool, selected the arm and re-positioned it (Fig.09). Because the parchment roll was quite narrow with a consistent width, I decided to widen certain sections to make it look less like bandages (he's not meant to be a mummy!). I also added some extra strips on the left hand side to help balance the www.zpfl.netposition. One other modification involved increasing the contrast by way of a Curves adjustment layer. Alongside this I also varied the background to help emphasize the light and dark areas across the character, and create a better sense of volume. One of the key elements included in the description and so far missing was some evidence of text or script across his skin. To do this I searched the internet for some medieval manuscripts, which I then copied into a new layer and color corrected before setting to Multiply. By isolating and selecting specific areas I was able to use the Warp tool to curve it around different regions to better match the contours of the skin. You can see these in Fig.10 (main image) alongside a detail (inset). This concluded the inclusion of all the key www.zpfl.netponents, but one thing that remained fundamentally wrong was the angle of the lower legs. The angle or curvature of the strapping was inconsistent with the bend in the knees, which suggested a more frontal view. In Fig.11 you can see the adjusted view on the right, showing the correct perspective www.zpfl.netpared to the original on the left. The purple overlay shows the angle of the lower legs in relation to his thighs and highlights the problem. The image was all but www.zpfl.netplete at this point, but one last addition I wanted to include was some evidence of a force-field or supernatural energy surrounding the quill's motion. To do this I created some curved strokes with a simple brush and then added an outer glow by way of a layer style. To help integrate it into the scene, I painted in some reflective light across his left side using the same color as the outer glow, but with the blending mode set to Linear Light. The final version can be seen here in Fig.12.